New York — Uniqlo will continue its expansion in the United States by opening five stores this spring/summer, including its first-ever location in the greater Philadelphia metropolitan area. Great Mall of the Bay Area in Milpitas, Calif.
“We are thrilled to announce our newest store openings and are eager to bring the Uniqlo experience to even more communities throughout the United States,” said Larry Meyer, CEO of Uniqlo USA and Fast Retailing Group senior VP. 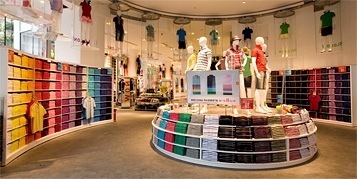 Currently there are 17 Uniqlo stores in the United States: three in New York City, five in New York State, three in New Jersey, one in Connecticut, and five in the San Francisco-Northern California area. In the fall of 2014, Uniqlo plans to debut in new markets including downtown Philadelphia, Boston, and Los Angeles-Southern California. In addition, Uniqlo announced that it will close the second floor of its 5th Avenue store in New York City for renovations and will reopen the section in March. Customers will be able to shop the other floors during construction. Posted on January 7, 2014, in #international, #retail. Bookmark the permalink. Leave a comment.